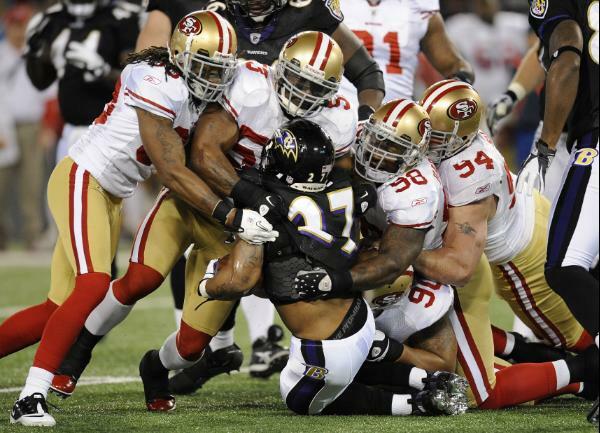 If the NFL plans to return to Los Angeles in 2013, there’s only one team that can pull it off. The Chargers. A comparison of Sam Farmer’s Friday item in the Los Angeles Times regarding Commissioner Roger Goodell’s recent memo on the possibility of a move as soon as 2013 with the NFL’s relocation policy (a copy of which PFT has obtained) with the realities of the various stadium and ownership situations reveals that the San Diego Chargers (who actually spent their initial season in Los Angeles, losing the AFL title game to the Oilers) are the only team that currently can pull off a move by next year. The Rams can’t leave St. Louis at the earliest until after the 2014 season. The Jaguars must demonstrate three straight years of losses before being able to exit Jacksonville. The Raiders’ lease situation is irrelevant, because (as we’ve previously reported) the league won’t allow them to move to L.A. unless Mark Davis sells controlling interest in the team. So that leaves the Chargers, who have an annual window to cancel their Qualcomm Stadium lease, from February 1 through April 30, with a buyout that decreases each year. (For 2012, the cost was a mere $23 million, $2 million less than what Jaguars owner Shad Khan would have to pay former owner Wayne Weaver if the Jags move before 2017.) The Chargers’ three-month escape hatch overlaps by 15 days with the league’s relocation policy, which requires notice of an intention to move to be filed with the league office between January 1 and February 15. The relocation policy also requires a team that hopes to move “to work diligently and in good faith to obtain and to maintain suitable stadium facilities in their home territories, and to operate in a manner that maximizes fan support in their current home community.” Relocation is appropriate only “[i]f, having diligently engaged in good faith efforts, a club concludes that it cannot obtain a satisfactory resolution of its stadium needs.” In other words, a team can’t move without showing that it has exhausted all reasonable efforts to stay put. It won’t be hard for the Chargers to demonstrate that they’ve tried to work things out in their current home. After all, the Commissioner has publicly said that “unfortunately, some sense of a growing impasse and an absence of a sense of urgency” exist regarding efforts to build a new venue in San Diego. The Commissioner who said that was Paul Tagliabue. The year in which he said it was 2004. Then there’s the fact that San Diego will be picking a new mayor in November. Earlier this month, a preliminary election narrowed the field for the looming runoff to two candidates: Republican Carl DeMaio and Democrat Bob Filner. Both oppose using public money to build a new Chargers stadium. DeMaio says that fixing streets and restoring services remains a bigger priority, and Filner doesn’t want to subsidize a billionaire without partial ownership of the team by the city, something that the league would never allow. So the handwriting is on the wall, San Diego. If any NFL team is going to be in Los Angeles by 2013, it’s the Chargers who will be, well, bolting. Cedric Benson might be the most notable name on the free agent list. He’s run for more than 1,000 yards in each of the last three seasons, but hasn’t found work in a league that has moved away from employing workhorse backs like Benson in recent years. He’s been linked here and there, but nowhere with more frequency than Oakland where the Raiders could use someone to do what Michael Bush did for them in recent seasons. Nothing has happened yet, but Adam Schefter of ESPN reported on NFL Live Friday afternoon that it still might. Schefter reported that Benson is still on the Raiders’ radar and that he could be signed just before or just after training camp gets underway in a month. Bill Williamson of ESPN.com reported earlier this week that the Raiders were interested but that “salary cap and money issues” were getting in the way of a deal. If they can iron them out, Benson could make a good complement to Darren McFadden. His powerful style would mesh well in spots where McFadden’s flash is less useful and the former Bengal can also fill a bigger role if the Raiders want to limit McFadden at times in hopes of keeping him healthy. Their current backups — Mike Goodson and Taiwan Jones — don’t have Benson’s track record and haven’t inspired much confidence that they can provide the proper balance with McFadden. 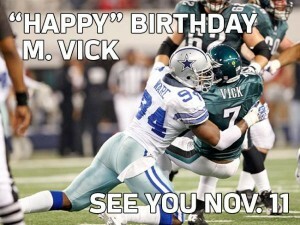 The Eagles and Cowboys engaged in a little Twitter trash talk this week, occasioned by Michael Vick’s birthday. For those who don’t recall, in two games against the Cowboys last season Vick went a combined 39-for-60 for 572 yards, with four touchdowns and no interceptions, plus another 10 carries for 60 yards. The Eagles won the two games by a combined score of 54-14. In this Cowboys-Eagles battle, I’d have to say the Eagles come out on top. Just as they did twice on the field last season. When Chad Ochocinco was released by the Patriots, there were two assumptions made, neither flattering. 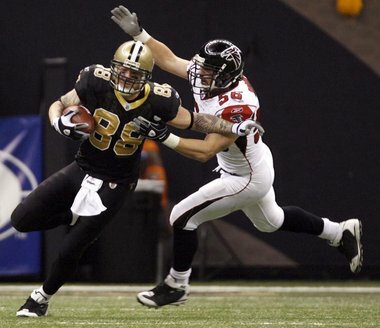 One was that he couldn’t run anymore, since there was no evidence of his previous big-play ability. Two was that he never learned the Patriots playbook sufficiently to perform. While his new Dolphins teammates have been impressed with his physical condition, team officials apparently were wondering about the mental. 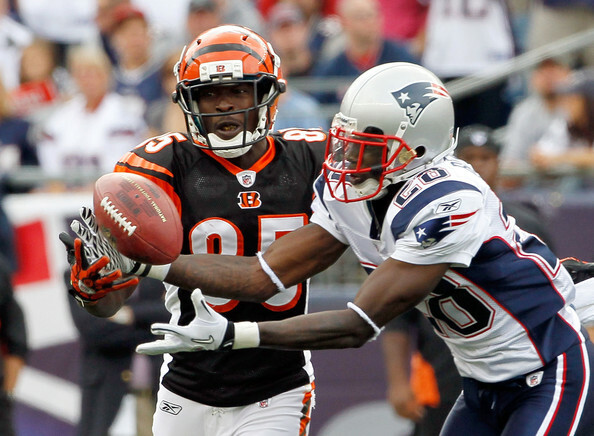 A Dolphins source told Greg Bedard of the Boston Globe that Ochocinco admitted as much when he met with the team. Now, he’s joined a team that had already installed most of its offense by the time he showed up. What could possibly go wrong? 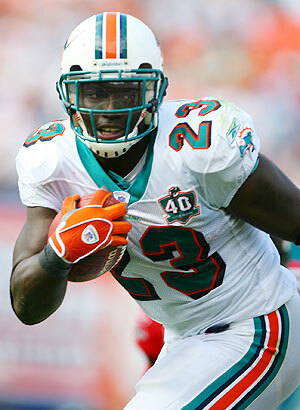 Still, signing Ocho is a low-risk move for the Dolphins. For the one-year deal to be worth the reported $2 million, he’d have to perform at a high level. They don’t really have many good receivers, and if he can play, he helps the team. His circus act will also be good for business when Hard Knocks rolls into town, at least drawing attention away from others who might not know as well as he does how to handle it. We’ve been following the Saints bounty program case long enough that there have been multiple flashpoints that seemed huge at the moment and faded into the background of the next round of revelations. One of those things was Warren Sapp erroneous report that Jeremy Shockey was the whistleblower that tipped the NFL to the program in the first place. Since then Sapp was benched by the NFL Network (although he kept his job), given his walking papers at Inside the NFL and debuted as a judge in a new internet show. 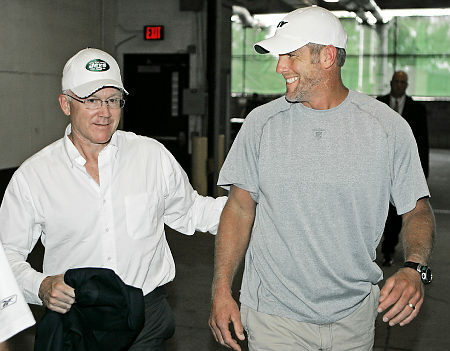 And he’s also apologized to Shockey. Whether that satisifies Shockey’s desire for an apology remains to be seen, but Sapp said he’s seen Shockey subsequently without any problems between the two of them. It was a busy day of news on the Percy Harvin front and it got busier on Wednesday afternoon when Harvin skipped practice at the Vikings’ mandatory minicamp. Harvin was present at a walkthrough on Wednesday morning, but was nowhere to be seen during practice. 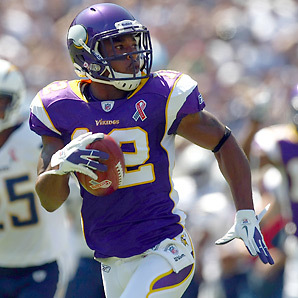 Unless the Vikings excused his absence, Harvin could be fined for skipping the practice. Coach Leslie Frazier said he didn’t know if Harvin, who reportedly requested a trade a day after hinting at a training camp holdout, would be with the team on Thursday before trying to turn attention away from the missing wide receiver. General Manager Rick Spielman said Wednesday that the team wouldn’t trade Harvin, who is believed to want both a new contract and a bigger role on the team’s offense. 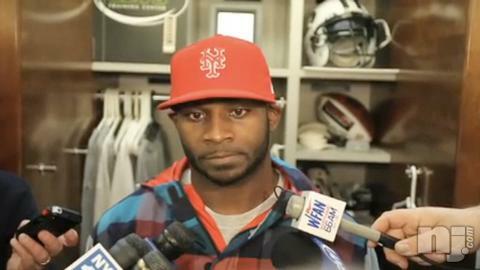 Harvin has two years left on his rookie deal and is set to make $915,000 this season. He’s hinted at a training camp holdout, something that seems more possible after his failure to practice on Wednesday. The Vikings can’t afford not to have Harvin on their offense this season, something that Harvin surely knows as he plots his next move. And, based on all that’s gone down in the last couple of days, there will be a next move. Dolphins quarterback Matt Moore was on the practice field with new Dolphins receiver Chad Ochocinco today, and Moore says that those who believe Ochocinco just doesn’t have it anymore are wrong. According to Moore, Ochocinco doesn’t look like he’s lost a step and looks like the player he says he’s going to be, the Chad Johnson of old. 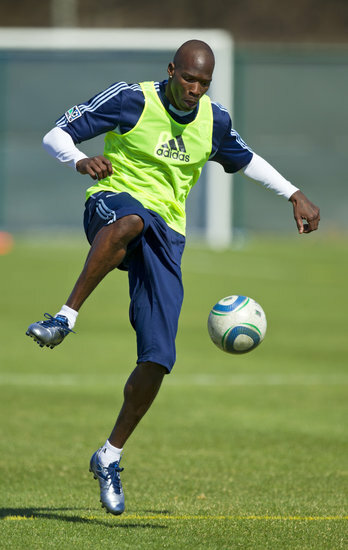 Ochocinco, who grew up in Miami, said he’s thrilled to play with the team he grew up cheering for. 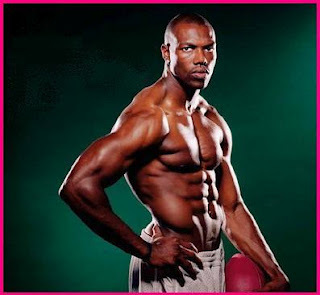 When Chad Johnson was a young football fan in Miami, the Dolphins had one of the best passing games in the NFL and Dan Marino was throwing to receivers Mark Clayton and Mark Duper. Ochocinco wants to be part of the revival of the Dolphins’ passing game. If Moore is right that Ochocinco still has the speed he had in his best seasons with the Bengals, it will indeed be a pretty good feeling in Miami. LaDainian Tomlinson drew some inspiration from former Chargers teammate Junior Seau as he officially announced his retirement from the NFL on Monday. Tomlinson told a room filled with current and former Chargers that he had opportunities to keep playing in 2012, but chose not to pursue any of them. He explained the decision when he talked about the sacrifices of time away from his two young children and about the toll the passing years have taken on him. Tomlinson pointed out that he made it through his entire career without ever having surgery and thanked the equipment managers for helping keep him out of the operating room. There were questions about possible comebacks and whether Tomlinson still had the fire to play as well. He said he thought he would always have the fire, but belied no traces of it as he ruled out the chance of another tour of duty down the line. When Tom Brady was asked to name his enduring Super Bowl memory at a charity event Friday night, the possibilities seemed endless. After all, the New England Patriots quarterback has won three title games and been to five -- fertile ground to mine for a memory or two. Brady conjured up an odd one. "This year after the game, I was in my hotel room after the game, and this was not a good memory, by the way," Brady said lightheartedly, per Tom E. Curran of Comcast SportsNet New England. 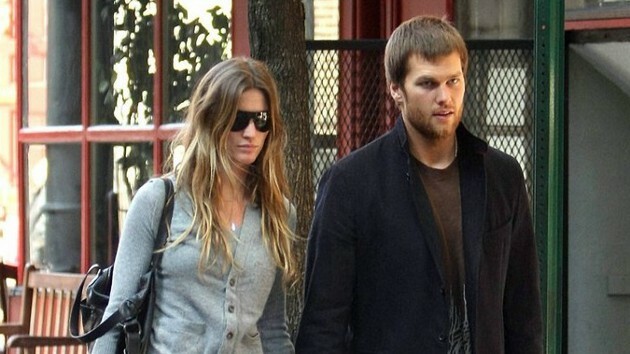 "I was going to bed and I was talking to my wife (supermodel Gisele Bundchen) after the game. You just sit up and you think and nobody quite understands -- your wife and your parents or best friends -- they just don't quite understand how you're feeling. You're just going through play after play after play after play. "Just before she goes to bed, she says, 'Yeah, people were following me and I just said something I shouldn't have said.' "
Brady told her, "I don't care really what you said. Just go to bed." We all know what she said. After New England's frustrating loss to the Giants, Bundchen ripped the Patriots wideouts in a tirade aimed at a group of heckling New York fans. "You need to catch the ball when you're supposed to catch the ball," Bundchen said. "My husband cannot (expletive) throw the ball and catch the ball at the same time." "I woke up the next morning, I tapped her on the shoulder (and asked), 'Why did you say that?' She was talking about the best player on our team, Wes Welker, yeah. That was my most recent memory." Colt McCoy was dealt a bad hand in Cleveland, from the poor supporting cast last year to the concussion against Pittsburgh to the drafting of Brandon Weeden to replace him. But, according to Tony Grossi of ESPNCleveland.com, the Browns don't want to add insult to injury by just dropping McCoy on the waiver wire and releasing him. Browns president Mike Holmgren sort of danced around the topic of whether or not he would keep both McCoy and Seneca Wallace to back up Weeden. 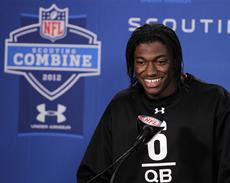 “Right now, we have three quarterbacks that are going,” Holmgren said. “Between now and the time we play our first ballgame against the Eagles, I would ask you, you shouldn’t be surprised by anything. We are going to be talking to teams about a lot of different things, not just the quarterback situation. That’s what happens and then as you approach the regular season, when you get to final cutdown, there is a lot of action that takes place. So if the Browns are open to McCoy not being part of the team in 2012, but don't want to outright cut him, then they need a trade partner, and, according to Grossi, won't ask for much in return to find McCoy a new location. Charles hasn’t lost his edge as the spring winds down and turns into summer. Recovering from a torn left ACL, Charles guaranteed to the Kansas City Star Wednesday that he’ll be medically cleared for training camp. “When they let that cape off me, I’m ready to go,” said Charles, who’s roughly nine months removed from the ligament tear. “I’m ready to put my cleats back on and punish everybody in my way.” Charles went so far as to suggest that he’s already game-ready. Along with teammates Tony Moeaki and Eric Berry, Charles will seek medical clearance from team doctors next Monday. The trio of ACL victims has been absent from all pre-training camp activities. 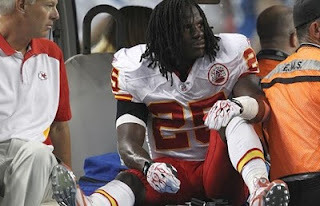 Charles is the best player of the three, and the Chiefs’ 2012 outlook very much hinges on his return to effectiveness. When healthy, Charles is arguably the NFL’s most dynamic rusher south of the Twin Cities. From all indications, rookie Brandon Weeden will be the Browns’ starting quarterback this season. So what does that mean for the two quarterbacks who started in Cleveland last year and remain on the roster this year, Seneca Wallace and Colt McCoy? According to Wallace, it means one of them will be out of a job. “We all know the third guy doesn’t dress on Sundays and if that comes down to that decision, obviously neither one of us [Wallace or McCoy] wants to be that third guy,” Wallace said. For his part, McCoy isn’t ready to concede that Weeden is going to start. “When I come out to practice, in my mind, I’m the starter,” McCoy said. 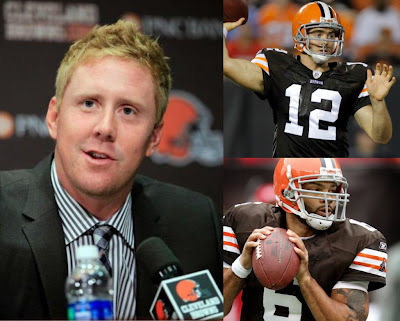 That might be the case in McCoy’s mind, but in the mind of Browns coach Pat Shurmur, Weeden appears to be the favorite to start. And that means McCoy’s training camp competition may be with Wallace, to see which one of them deserves a spot on the roster at all. Safety Troy Polamalu has suddenly become an elder statesman for the Steelers. The departure of several veteran players from Pittsburgh this offseason has thrust Polamalu into a more prominent leadership role this season and it’s one he’s embracing. He’s been in Pittsburgh for offseason work for the first time in years and he’s making an effort to connect with younger players. The new role and the passing of years have made Polamalu reflective of where he is in his career. 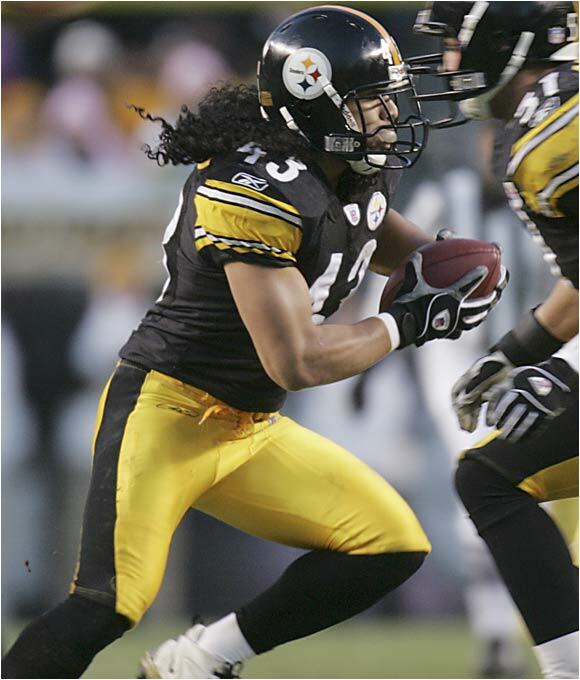 In an interview with Joe Starkey of the Pittsburgh Tribune-Review, Polamalu said he isn’t thinking about the end of his career because “when you live day to day, it’s hard to talk years.” Polamalu knows that living day to day doesn’t always offer much solace, however. With so much attention on concussions and the post-football health of players, Polamalu offers some interesting insight into the thoughts of the players who choose to play the game. The whole interview is well worth a read as it delves into Polamalu’s internal thoughts as he prepares for his 10th NFL season. The HBO/NFL Films cameras crews may want to pack up for Davie sooner than planned. Receiver Chad Ochocinco will work out for the Dolphins this week, according to Jason La Canfora of CBSSports.com. 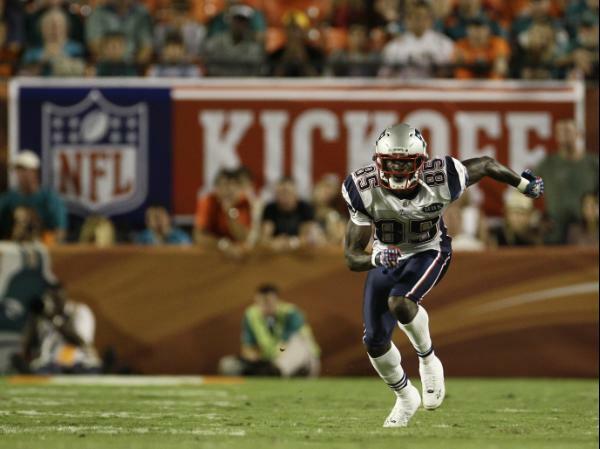 Which means that Ochocinco’s reported interest in the Dolphins is, for now, reciprocal. No other team has been linked to Ochocinco, yet. News that he’s drawing interest from a team that is looking for attention could force anyone else (if there is anyone else) to move quickly in order to draw Chad’s attention. Chargers coach Norv Turner recently said that running back Ryan Mathews reminds Turner of Ricky Williams. The comparison becomes even more clear now, given that the Chargers have added the guy who used to share touches with Ricky in Miami. The Chargers have announced that running back Ronnie Brown, the second overall pick in the 2005 draft, has joined the team. It’s a one-year deal for a guy who languished on the free-agent market. Though on the wrong side of 30, Brown never has been a workhorse back, which means that the tires likely still have some tread. The decision to join the Chargers seems odd, given that the Chargers plan to use Mathews extensively. Barring injury, Brown could get the same limited reps that he received in 2011, when he served as the understudy to LeSean McCoy. The Eagles actually tried to trade Brown straight up for running back Jerome Harrison in October. The trade was voided after Eagles doctors found that Harrison had a brain tumor. 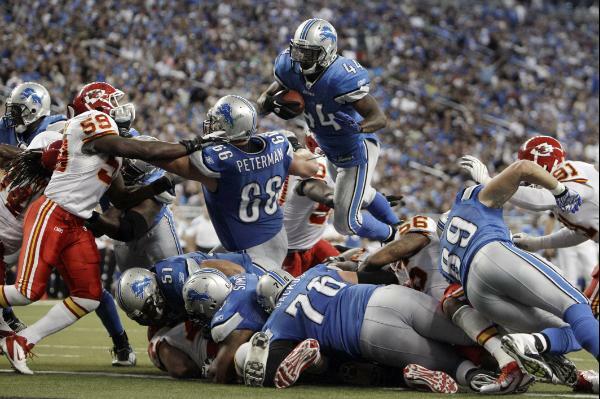 But neither the Lions, nor anyone else, pursued Brown aggressively once he became available on March 13. Brown also brings to the table the ability to run the Wildcat offense. It’s perhaps the skill for which he became best known, until of course he tried to improvise in bizarre fashion last year for the Eagles. As it stands, we'll never know what a Google search for "Lauren Tannehill and Maxim" could have meant for this proud nation. The wife of Miami Dolphins rookie quarterback Ryan Tannehill generated just a little bit of buzz after photos from her recent modeling shoot went viral. Dressed in Miami's team colors and clutching piles of Florida oranges, Lauren's handiwork with photographer Roger Snider was rumored to be headed for the pages of Maxim. Tannehill's talent agency, Page.713, pumped the brakes on those reports this week. "That was a spec shoot designed to be sent out and Maxim was one of the options," agency manager Erik Bechtol told the Bryan-College Station Eagle on Monday. "A lot of blogs have reported that it was for Maxim and that is not accurate as of now." Lauren's fledgling modeling career aside, not sure the final resting place of these photos matters. Maxim or not, she's a lock for mezzanine-level stardom without exerting much effort. Besides, with HBO's "Hard Knocks" set to focus its lens on the Dolphins this summer, bank on it: This won't be the last we hear from our friend, Mrs. Tannehill. Detroit Lions running back Jahvid Best had the bulk of his 2011 season wiped out by a concussion, but he says he's now symptom-free and moving forward with his career. "I'm pretty sure if there was any real damage going on, I would have physical problems and mental problems," Best said Monday, according to MLive.com. "I have no problems. I'm not worried." Best might not be worried (on the surface, anyway), but he's now up to three documented concussions during his career. It's possible he's suffered more. As Asher Allen illustrated last week, we're dealing with tricky business here. Of course, it's all a matter of perspective for Best, who suffered one of the nastiest-looking head injuries in recent memory during his college days at Cal. "That one I was actually unconscious, so that was totally different," he said. "That's why I'm not worried about it. If I can come back from that one, this one should be a piece of cake." Let's hope Best is right. Running back Ray Rice spent some time with his Ravens teammates this weekend on an athletic field. It wasn’t a football field, though. Rice joined many other Ravens at a charity softball game organized by cornerback Lardarius Webb. Rice told Aaron Wilson of the Carroll County Times that he missed being around his teammates, but wasn’t worried that missing offseason workouts would hurt him once the season rolls around. Rice’s familiarity with the offense certainly makes it easier to go without him at this point in the offseason. The question going forward is how long they’ll have to go without their top back. Rice said that he’s letting his agent take care of the business side of things while he stays in shape. The Ravens and Rice have until July 16th to work out a new deal and there haven’t been any signs that one is right around the corner. 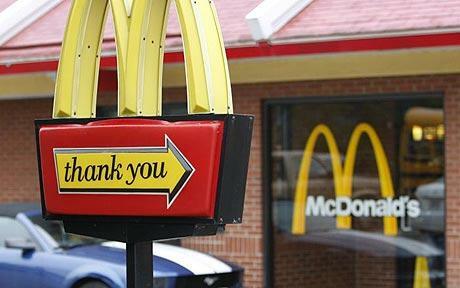 The franchise tag would pay Rice $7.7 million for the 2012 season. PFT reported last week that the Houston Texans would be trying out free agent running back Justin Forsett on Wednesday. That tryout, indeed, took place, and on Saturday Forsett revealed on Twitter that he’s agreed to terms with the Texans. 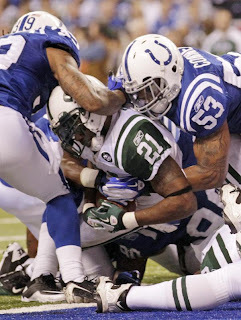 The Texans have an opening at the third tailback spot behind Arian Foster and Ben Tate. Forsett should be able to win that position, assuming he stays healthy in training camp. 26 years old, Forsett has averaged 4.6 yards per carry in his career with 97 catches. He is familiar with the Texans’ zone-blocking scheme dating back to his days at Cal. If Foster goes down during the season, Tate could be the early-down workhorse with Forsett playing in passing situations. He excels as a receiver. After his phenomenal rookie season, all of the pre-draft criticisms about Panthers quarterback Cam Newton now seem pretty silly. But the one that seems silliest — about his fake smile — is one that Newton is still scratching his head over. In an interview with Hannah Storm on ESPN, Newton was reminded that 14 months ago, draft analyst Nolan Nawrocki called Newton, “Very disingenuous — has a fake smile, comes off as very scripted and has a selfish, me-first makeup.” Newton said he’s not angry about those comments, but he is puzzled about which sources might have told Nawrocki that he has a selfish, me-first makeup, because Newton doesn’t believe that’s something that people who know him would say. 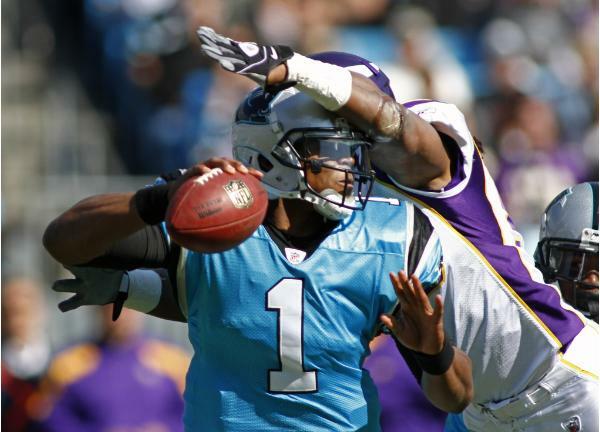 Newton said his feelings weren’t hurt by hearing those things about him, but he acknowledged that it’s hard not to be at least a little bit taken aback by learning that people are questioning him not only as a football player, but as a person. “I don’t think there was anything that hurt, but at the end of the day I’m still human,” Newton said. And it’s only human to wonder which sources were doubting you — and to keep wondering even after you’ve proven them wrong.